Every year, the International Youth Library in Munich, Germany selects 200 exceptional books from all over the world, which are then introduced with short annotations in an English-language catalogue. Books are chosen based on their potential interest for an international audience, whether due to their innovative literary or illustrative quality, or due to their consideration of universally relevant topics. These books are awarded with a White Raven. I'm very happy to have read that this year my latest book with the wonderful Mattias De Leeuw, HET TELBOEK VAN PRINS HAJO DE GELUKKIGE (THE COUNTING BOOK OF PRINCE HAYO THE HAPPY) was chosen as one of 2017s White Ravens. 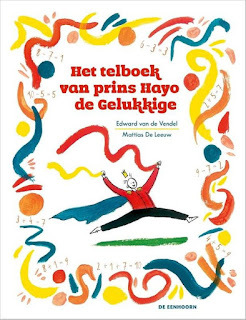 The book was originally published by De Eenhoorn in Belgium, but is, so far, also translated into German and Korean.